Don’t we all worship the god of shortcuts? With manifestos coming at us left, right and centre, a rally schedule to keep up with, and staying up-to-date with who is saying what, the General Elections can get a little crazy — not that we’re complaining. For most of us, the election season is one of the rare moments when we get to see Singaporeans at their most proactive and free-spoken. Who is fighting for our CPF, who is against the influx of migrants, who thinks salaries of ministers should take a cut — so many questions. For those of you who want out from the craziness and haven’t really put together what each party is proposing, here’s a shortcut: Electionaire. 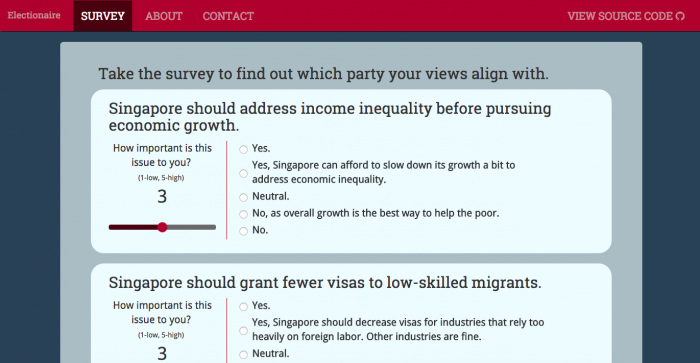 Created by a group of third-year students at Yale-NUS College, Electionaire is a simple survey where what you answer for every question determines your political alignment. You’re required to choose from a spectrum of responses ranging from Yes to No, and rate how important the issue in question is to you. With just 15 questions, Electionaire will rank all 10 parties according to how you scored from the survey. It barely takes five minutes to complete the whole questionnaire, which makes choosing sides so easy, and almost fun. But is it really accurate? We can’t help but think that the questions are framed in a way that is favourable to the opposition — they all ask if we would support a change from existing policies of the incumbent party. Still, for some of us, the results that we got were nothing surprising. Besides, dude, get out there and read up on what the parties are really saying. Electionaire is good supplement to the battlefield of the General Elections, and guides you to what you should be listening to. Ultimately, though, we really shouldn’t base our decision on a quick survey, yes? It’s going to be an important decision that you will be making this Friday, so get informed! The post Find Out Which Party You’re Actually Supporting This GE2015 With A 15-Question Quiz appeared first on Vulcan Post.